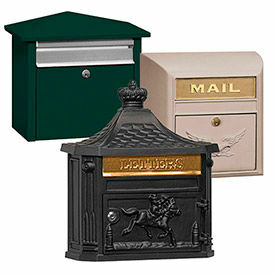 These Versatile Letter Boxes Can Be Mounted Directly To A Wall Or Used With A Rural Post. Wall mount mailboxes are available in 14 gauge electro-galvanized Steel, 14 gauge corrosion resistant Stainless Steel or lightweight and rust resistant Aluminum. Letter lockers are made with one-piece framing for maximum strength. Incoming mail slots and outgoing trays are secured behind a magnetic hopper door. These mailboxes include 5-pin cam lock with 3 keys for security. Hardware included. Choose between Horizontal or Vertical styles. Powder coat finish available in Black, White, Gray, Tan and Bronze. Requires Post Office approval prior to installation. Conditional Lifetime Limited Warranty. Horizontal Letter Boxes feature a 2 H x 11 W horizontal mail slot to accept larger envelope delivery. Vertical Mailboxes feature a 3-1/4 H x 10-3/4 W incoming mail slot and 1-1/4 H x 10-1/2 W outgoing mail tray. 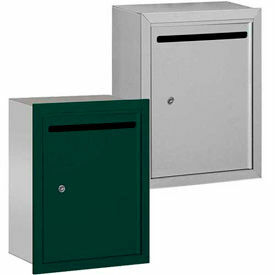 Vertical Rear Access Mail Boxes feature a locking door in the back, instead of the front. Used for recessed settings. X-Large Vertical Drop Boxes feature a 5 H x 14 W incoming mail slot and a 2-1/2 H x 13-1/2 W x 6-1/2 D envelope holder. Includes a chain-mounted pen and personalized drop envelopes for immediate use. Great for after hour drop box applications. Mail Collection Boxes Keep Outgoing Mail Secure As It Awaits Pick Up. 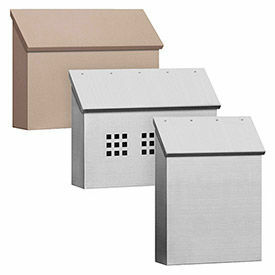 Mail Collection Boxes are constructed of aluminum for long lasting durability. USPS approved letter box includes a narrow mail slot and locking front door to prevent mail theft and tampering. Alternate use as payment drop off or after hours key return. Mail boxes are available with commercial keyed lock or provision for USPS lock. Available styles are Recessed and Surface Mount. Color finishes are Aluminum, Brass, Bronze, Green and Sandstone. Salsbury Front Opening Mailboxes Are Designed to Withstand All Weather Conditions From Rain And Snow To Full Sun And Heat. Salisbury Front Opening Mailboxes are made from die cast aluminum or galvanized steel for weather-resistance and durability. Narrow mail flap and locking front access door prevent mail theft and tampering. Door lock includes 2 keys for convenience. Mailbox is finished in a durable powder coat to resist mars and scratches. Meet U.S.P.S requirements for residential door mail delivery. Available styles are Mail House, Modern, Modern with Eagle Door and Victorian. Color finishes are Beige, Black, Green and White. Salsbury Top Opening Traditional Surface Mounted Mailboxes Feature A Clean, Classic Design To Enhance Any Commercial or Residential Building. 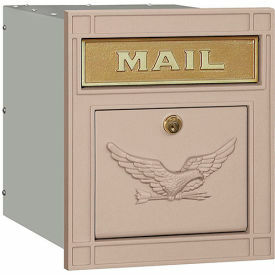 Salsbury Top Opening Traditional Surface Mounted Mailboxes are made from brass, aluminum or galvanized steel to withstand harsh outdoor elements. Hinged door protects mail from weather and theft. Meet U.S.P.S requirements for residential door mail delivery. Available styles are Standard, Decorative or Town House. Color finishes are Brass, Silver, Black, Beige, White and Green. Decorative Column and Masonry Mailboxes Enhance Visual Décor For Applications Including Residential, Commercial, Hospitality And More. 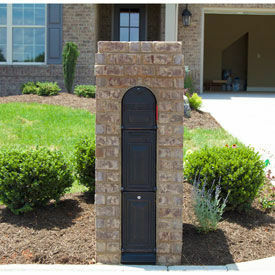 Decorative column and masonry mailboxes are made of high quality materials for long lasting durability. Units include large compartment door for convenient access to letters, periodicals, packages and more. Includes powder coat finish for corrosion resistance. Features optional locking system for content stability and protection. Types include Front Access, Front/Rear Access and Rear Access. Available styles include Column Mailbox/Bloomsbury Door, Column Mailbox/Kingsbury Door, Decorative Fleur De Lis Door w/ Security Option/Column Mailbox, Decorative Fleur De Lis Door/Column Mailbox, Decorative Fleur De Lis Door-Security Option/Column, Decorative Scroll Door w/ Security Option/Column Mailbox, Decorative Scroll Door w/ Security Option/Column Mailbox, Decorative Scroll Door/Column Mailbox and more. Lock types include Keyed Differently, Keyed Lock and Push Button Lock. Package quantity is 1. Colors are Antique Copper, Beige, Black, Brass, Bronze, Burnt Tuscan w/ Antique Copper Door, Burnt Tuscan w/ Black, Burnt Tuscan w/ Brown and more. Meets USPS requirements. Dimensions vary per model. Ore Vaults Vaulted Column Mailboxes Provide Mail Storage And Security For Residential Applications. 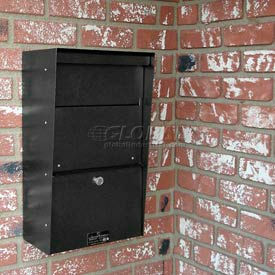 Ore Vaults vaulted column mailboxes are made of high quality materials for long lasting durability and dependability. Mailboxes include dual access doors for security and theft prevention. Unit features locking vault with security key for secure content storage and access. Furniture grade pulls and stainless steel hinges provide optimal strength and performance. Galvanized metal and powder coat doors provide corrosion resistance. May be securely bolted on a level concrete pad and encapsulated with brick, rock, stucco, or wood. Models are Vaulted Mailbox and Vaulted Mailbox/Parcel Box. Available styles include Bountiful Life, Classic Shadow, Climbing Leaf, Fleur Fore, and Hos Pineapple. Types are Front Access and Front/Rear Access. Package quantity is 1. Colors are Black, Gold, Oil Rubbed Bronze, and Silver Pewter. USPS approved. Dimensions are 9-1/2"W x 20-7/8"D x 48-1/2"H.